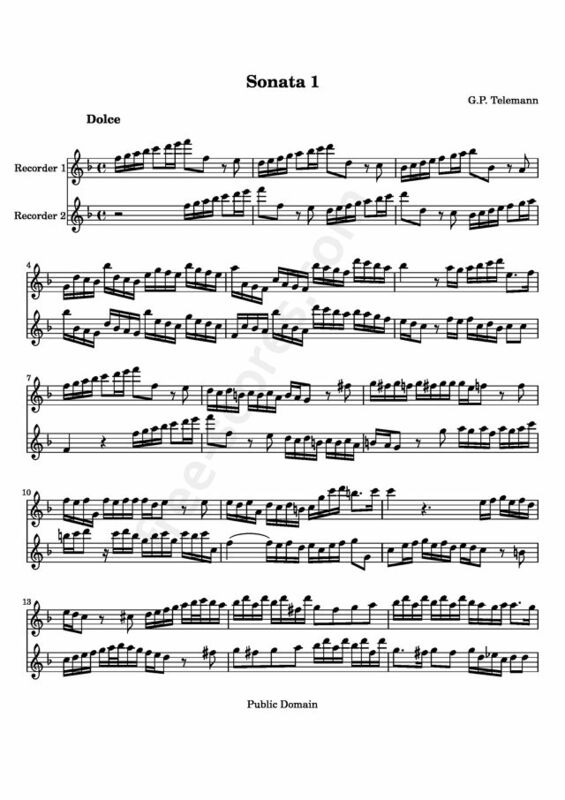 I downloaded your PDFs for Telemann's recorder sonatas and found that much of the music is beyond the range of a soprano recorder, above D5. Am I in error? Thank you, i have updated this information. If you're interested, it's sonata TWV 40:102. I think it's important to know what to play. I think the level depends on the age of the player. An adult beginner could play this (well?) within a year of starting the recorder (if they practised enough), but most recorder players are school kids and would find this to be 'advanced'. My ten year old son has been playing the recorder for many years, but doesn't practice much and would find the high notes a challenge. But the rhythms and note progressions are pretty simple, so I expect he'll cope (once he gets over the shock of it being 8 pages long!). Nice to see out-of-copyright music being published in the public domain for free. It would be nice if all sheet music was available online for free download - perhaps the ad revenue would be sufficient to pay royalties to composers whose material is still in copyright. Please. I need the second and third movement of Sonata in Do M. of Juan S. Bach. for play in concert. You can help me? I do not understand why it is being suggested a mistake to say these pieces are not suitable for the novice. It is simply not a very difficult instrument nor are these difficult compositions. Any competent player should be able to play this sonata within the first year of learning the instrument with casual yet regular practice. To play it well, you need to be well beyond intermediate level. Very rewarding duet to play, it transports you to heaven. Love all Telemann recorder music. Can we fans have more?